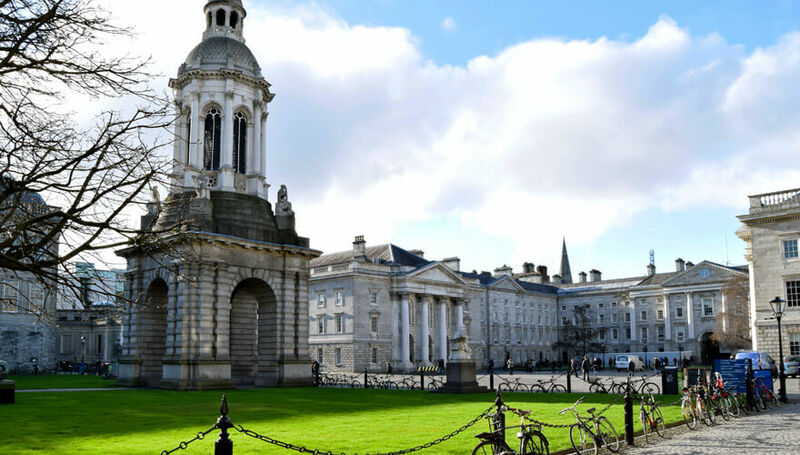 Medicine in Trinity College is known as one of the most difficult courses to get into in Ireland. These students will play a major role in the future of healthcare, in Ireland and worldwide. Someday your life might just depend on one. During placement at hospital, some of these students will experience things that most of us will never see. They’ll witness life-changing moments and hear about difficult upbringings and tragic back- stories. 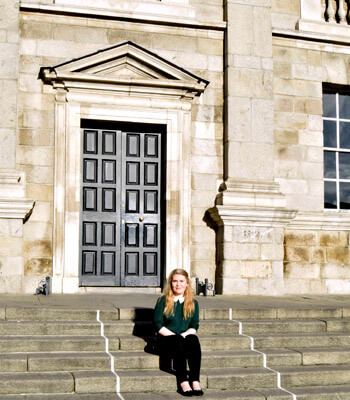 “Sometimes I’ve taken a step back and thought, oh I’m very lucky to never have had any of those issues” says Aisling Hickey, a Trinity medicine student. Aisling is currently in fourth year of the course and on placement. Dublin.ie: Did you always know you wanted to study medicine? Aisling: No. For me, in secondary school, it was always languages or medicine. I stuck with languages in first year of college. Then I realised ‘I’m not loving it’, so decided to give medicine a go, and here I am now. I would have always thought of medicine as a child, because my parents are doctors. It was always in the back of my mind, but the idea of medicine was hard, and I didn’t know if I wanted to get stuck with something so difficult. Dublin.ie: Do you feel that you still get to experience the ‘student life’ as a student of medicine? Aisling: It is more serious. The major thing that makes a difference is that we are just not on campus, we’re in hospitals. It means we are secluded from the rest of the student population. It takes a lot to come in and do the social life that other students would do when they are finished lectures. There are about 200 in the year which sounds like a lot but everyone knows each other. Our class and medicine in general is quite good for organising medical-related events, so we do still socialise. Inaugural Ball and Med Ball is coming up, so I’ll get out the long dress again! Dublin.ie: Is placement a big part of your course? Aisling: From third year, we’re basically on placement all the time. Last year I had one day of lectures a week and it’s currently the same with sporadic lectures here and there. I do prefer placement, but it is hard. You could be in there from like 8am to 7pm if your consultant isn’t particularly nice. And then, you’re seeing stuff that no one else gets to see. You hear about these tragic back stories and dying kids and everything. Dublin.ie: Have you ever got upset on placement when you have heard some of these tragic stories? Dublin.ie: The nursing students seem to work a lot of hours for little pay. Does that apply to medical students too? Aisling: No. We don’t get paid. The nurses are doing an actual job, they’re like an intern where as we are just observing. We might take a history or listen to a heart but we’re not going to be the ones making a diagnosis or anything. It’s more practice and gaining knowledge from consultants and registrars. The hours can be long, but it’s not like we are being worked to the bone or anything. I think the nurses have a lot tougher of a time than we would on placement, for sure. Then come intern year – all bets are off! Dublin.ie: If you could destroy one myth about being a student of medicine, what would it be? Aisling: The standard one would be that we are all nerdy. Or maybe, like, ‘entitled’. I think sometimes people have a perception that medical students are quite snobby, like ‘I do medicine’ and then it makes it worse when you say ‘I do medicine in Trinity’. I think there are a lot of different types of medical students, the book-learning ones that love to study and love research, like finding a cure for something or studying a trial. Then there’s the people that just love the social aspects of medicine, those that are just there to help people and science is just secondary. There is a lot of variety in medicine and in terms of the ‘entitled’, maybe some people are, but everyone comes from a different background. Dublin.ie: Do you know which area of medicine you would like to specialise in? Dublin.ie: What is the most disgusting thing you’ve had to do in a lab/practical work? Aisling: Urinary catheters. It’s not actually disgusting, it’s just quite uncomfortable when you’re doing it for the first time. Doctors are only trained to do them on men. So that’s kind of uncomfortable for your first time. You have to wait about four minutes for the anaesthetic to set in. You’re just standing there holding ‘the apparatus’ and just waiting. After your first few, you get used to it. Dublin.ie: Trinity has a ‘high class’ reputation. As a student here, would you agree that this is a correct reflection of the college and students? Aisling: I don’t think it is. I haven’t found that to be the case at all. I’m from Sligo and I’ve never felt anyone has looked down on that at all. Most people aren’t actually from Dublin here. We get a lot of international students because Trinity has quite a good reputation around the world. A lot of people come for that reason, so it’s a mixture of people. Traditionally, Trinity was a protestant college. I think Irish people thought it was snobby, because some Catholics were not allowed attend. I actually only learned recently, that you had to apply to the Catholic Bishop up until the 1970s if you wanted to go to Trinity. It wasn’t the protestant church that was saying no to people coming in. It was the Catholic Church that didn’t want people going here… so who are the snobby ones?